By redefining my terms I’ve now found myself in the middle of the third draft for Slaves of the Switchboard of Doom. They’re my terms. I’m gonna do what I like with them, and you’re gonna take it… and like it. I’d planned the second draft like this: two passes through the printed manuscript, resulting in so many penciled corrections that you could barely see the words any more; a line by line edit based on those changes… plus whatever else occured to me at the time; three new short scenes, a bonus expanded scene, and rewrites for two long sequences. Then… a last complete line by line edit. But by the time I was ready for that final item it seemed like what I had – after all those edits, added scenes, and rewrites – was a second draft; taking another complete pass through the book felt more like a third. So there it is. I redefined what the second draft was and found that I was already working on the third draft. I think this is what they do in Congress. 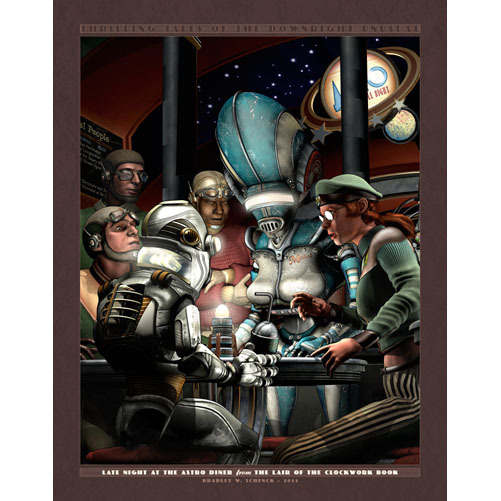 The switchboard operators of Retropolis find themselves replaced – due to an efficiency review – by a mysterious system they don’t understand. So Nola Gardner pools their severance pay to hire Dash Kent, freelance adventurer and apartment manager, to find out what’s happened to their jobs. That ought to be a simple job for Dash, even if his practical experience is limited to heroic rescues (of what he calls entities) from the Priests of the Spider God, in their temple at Marius Crater. But things go sideways once they unmask an insane civil engineer and his horde of black market robots; when a grisly discovery is made, late one night, in a darkened alley; when thousands of cheerfully maniacal scientists burst out of their seclusion in the Experimental Research District; and when, above all, people start shooting. 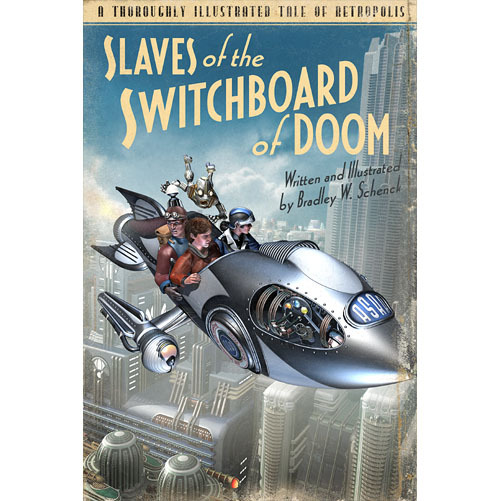 Allied with an unlikely assortment of human and mechanical people, Dash and Nola find themselves in a race to discover the hidden switchboard at the center of a plot that threatens every human person in Retropolis. Retropolis has found ways to contain its abundance of Mad Science. But in Slaves of the Switchboard of Doom we learn that if a civil engineer should go mad… he knows how to build madness on a scale that’s never been seen before. Slaves of the Switchboard of Doom (103,000 words, complete) is a light-hearted adventure set in one of our used futures: because nobody else was using it at the moment, and because the author wanted to do for the retro future something like* what Terry Pratchett has done for heroic fantasy. The Pratchett reference might go: that’s a thing that could easily do more harm than good in a query. But I’m so fond of a footnote that reads “No footnotes” that I just can’t change it yet. One curious thing is that even though the book’s word count has gone up and down, it always ends up in the same place. The line edits most often shortened it, but the new and expanded scenes enlarged it; and finally the much more streamlined opening cut it back down again. But over and over again it’s settled back to just about 103,000 words. Contents may settle during shipping. It just seems like that’s where it wants to be. In the spirit of the season – which is to say, in the spirit of Mad Science, Retro Rockets, and Things With an Unusual Number of Tentacles – here’s a friendly reminder that your friends are all pining for a little something from Retropolis, be that a poster, a sophisticated beverage containment system, one of those T-Shirts that all the cool young androids are wearing, or even a special little something from the Mug-O-Matic. 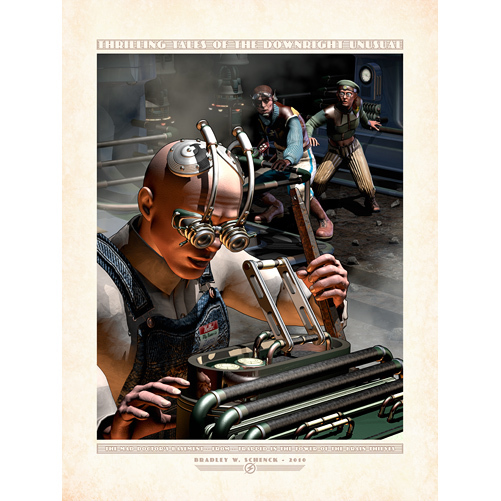 Or – for the ultimate in customization – consider the fine merchandise that lurches out of the ratcheting gears of the PULP-O-MIZER – the World’s Most Advanced Pulp Magazine Cover Generator. When the switchboard operators of Retropolis are suddenly made redundant after an efficiency review, they find they’ve been replaced by a mysterious system they don’t understand. Nola Gardner pools their severance pay to hire Dash Kent, freelance adventurer and apartment manager, to find out what’s happened to their jobs. That simple question leads Dash and Nola down the strangest streets of Retropolis, in the Future That Never Was, where robots consider the effectiveness of collective bargaining; where scientific research has been contained in a single neighborhood – by statute – to limit the regrettable side effects of innovation; where the world’s smallest giant robot rumbles toward its destiny with steps that cover an inch or two at a time; and where that question ‘What the heck happened to my job?’ leads ultimately to the Moon and back in an antique rocket that may be past its sell-by date. Retropolis has found ways to contain its abundance of Mad Science. But in Slaves of the Switchboard of Doom we learn that if a civil engineer goes mad… he knows how to build madness on a scale that’s never been seen before. 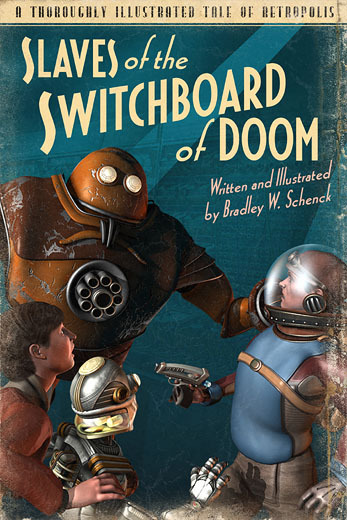 Here’s a cover concept and synopsis for Slaves of the Switchboard of Doom, because I guess I just don’t have enough to do while I edit my way through its (now) slightly more than 103,000 words. That was irony, if you didn’t notice. I have plenty to do. Over the past couple of weeks I’ve made two pencil passes through the printed manuscript, and then applied those edits. That leaves me three short scenes to write (because I wasn’t sure I needed them before) and two large scenes to rewrite; then, after one more complete pass through the book, I hope to have a pretty solid second draft – probably a couple of weeks from now. How solid? Will there be a third draft? Ask me in a couple of weeks. I try to avoid questions like those by working on cover concepts and the synopsis. I am adept at outmaneuvering my brain. The synopsis is an interesting exercise but it may also be pretty important. That’s because this time I figure I’ll try shopping the book around to agents and then – who knows? – maybe to traditional publishers. I’d like to see what happens. And a good synopsis, which this may or may not be, is something I’ll need when that day comes. And then – while the world rejects me repeatedly – I can get to work on the illustrations.